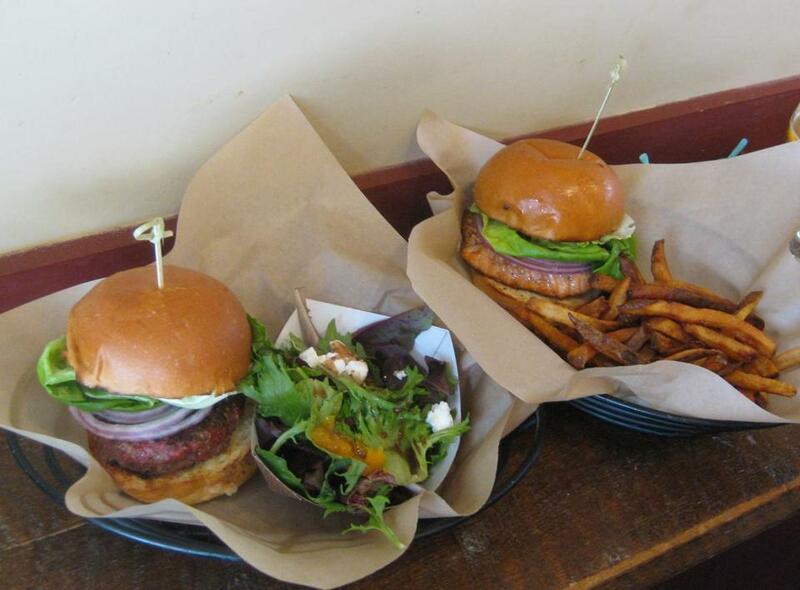 Burger, left, and “fish ’wich” lunches at Worthy Burger. SOUTH ROYALTON, Vt. — The formula is so simple, you have to wonder why there aren’t thousands of places like it. Worthy Burger, in an out-of-the-way spot in Vermont’s Upper Valley, serves a 6-ounce grass-fed patty cooked over a hardwood fire until pink and juicy, then tucked into a delicious little bun. If you want, heap it with condiments. And don’t forget the fries. They’re cooked twice in beef tallow. No one does this. Local, sustainable, farm-fresh is taken to the hilt here. Beef grazes on land nearby, buns are made at Norwich-based King Arthur Flour, craft beers are brewed by neighbors, and wood comes from the region. The Worthy Burger costs $6; most checks are under $20. Opened in 2012 in an 1850s railroad freight house, the industrial-looking Worthy Burger is not easy to find, and when you do, the area is slightly down-at-the-heels. The menu doesn’t offer a lot more than four burgers, fries, occasional specials, a Vermont cheese plate, a couple desserts, and craft brews. 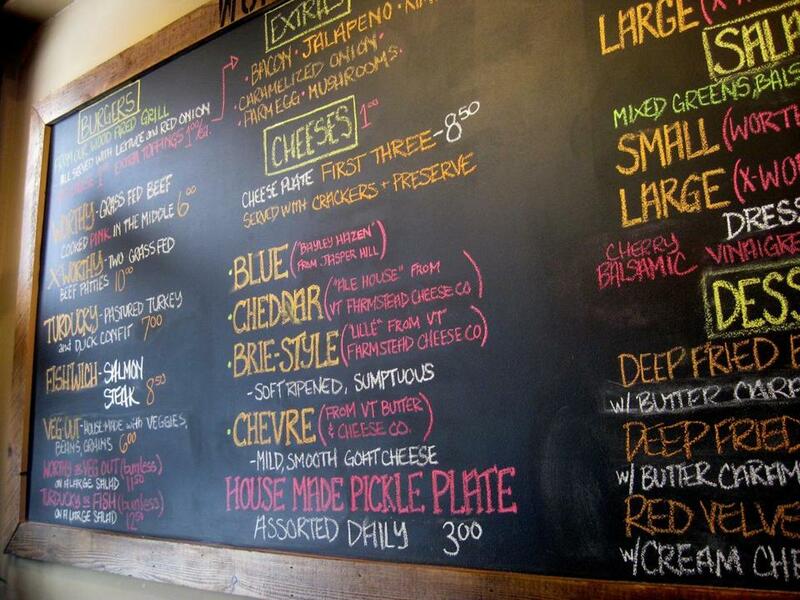 The blackboard menu at Worthy Burger in Royalton. The three owners were worried at first. “We’re on the wrong side of the tracks,” says co-owner David Brodrick, 54, “hidden away, town between exits, we’re all kind of like, Is anyone going to come?” So they designed a place the three could run themselves. Apparently it didn’t matter that whatever exit you take off Interstate 89, you still have to drive a couple miles. Word got out. On weekends, 300 people come, wait to belly up to the counter, order, and then pick up. There’s always a line for one of the 47 indoor and 30 outdoor seats; good-natured staff serve beer while you wait. Besides beef and turducky (turkey-duck confit) burgers, the menu has an exceptional “fish ’wich,” grilled selections from Massachusetts-based Wood Mountain Fish. That might be tuna, salmon, flounder, cod, or haddock, all given the wood-fire treatment so the fish is slightly smoky, and especially good with spicy mayo and homemade pickles from the condiment bar. They launched Worthy Kitchen in 2013 and call it a “farm diner.” The place is twice the size of the burger spot, with traditional entrees such as fried chicken cooked in lard. Doughnuts are also cooked in lard. (These restaurateurs love animal fats.) Fillings for popular tacos and burritos vary, but the chicken is always on the menu. Brodrick, Merrill, and Lessard all live in Barnard, near Woodstock, where many of Worthy’s purveyors farm. Young farmers were having a hard time getting their meat and produce into restaurants, says Brodrick; the Worthy trio now keep them busy. Some cooks say that pastured beef, while more flavorful than feed-lot beef, can be dry. The owners tried beef blends, which many chefs do (some butchers have a secret blend for every restaurant they supply). Black Watch Farm in Weathersfield sends beef to Worthy, and grinds “the whole cow,” says Brodrick. That means there are cuts like tenderloin in the mix, which you typically don’t find. 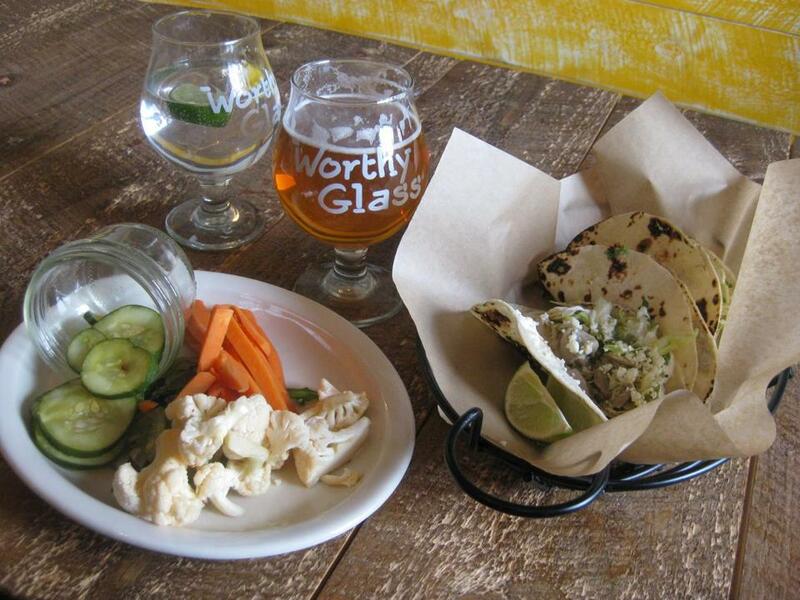 Tacos and pickles at sister restaurant, Worthy Kitchen, in Woodstock. At one end of the old freight house is Freight House Brewing, which expects to open soon. A Worthy catering arm goes to parties with a mobile wood-fired grill, and the company also does high-end catering. Once a week, the partners meet for a daylong business session. Where to open a third location invariably comes up. They nixed New York, they’re not sure about Boston because it’s so expensive, and they have tossed around smaller cities like Portsmouth, N.H.
What they don’t need to worry about is whether it’s a choice part of town. Build it, grill those burgers, and they will come. WORTHY BURGER 56 Rainbow St., South Royalton, Vt., 802-763-2575. Kitchen open Mon-Wed 4-10 p.m., Thu-Sat 11:30 a.m.-10 p.m., Sun 11:30 a.m.-9 p.m. Cash only. WORTHY KITCHEN 442 East Woodstock Road, Woodstock, Vt., 802-457-7281. Kitchen open Mon-Fri 4-10 p.m., Sat 11 a.m.-10 p.m., Sun brunch 10 a.m.-2 p.m., lunch and dinner 2-9 p.m. Restaurant stays open at least one hour after the kitchen closes, sometimes longer, depending on the crowd.